** ALUMINUM WHEELS ** HEATED AND ENCLOSED UNDERBELLY ** STAINLESS STEEL APPLIANCES ** OUTSIDE SHOWER! Introducing one of Jayco&apos;s best selling 5th wheel floor plans, the new 2018 Jayco Eagle HT 30.5MBOK rear lounge/mid bunk 5th wheel! If you&apos;re looking for high quality and the best of both worlds, here it is! The 30.5MBOK has (4) slides, a super spacious living area, a very private bathroom for Mom, a mid bunk room for the kids, all the newest upgrades and it comes with a 2 year warranty! Again, it has (4) slides with a north to south walk around queen bed and a wardrobe slide on the off door side! It has night stands on both sides along with wardrobes and over head cabinets. It has a very private side aisle bathroom with a walk in shower, a foot flush toilet, a sink with underneath storage, a linen closet and a medicine cabinet. Walking down the steps to the main living area, it has a small hallway and on the right side is the mid bunk room which has a (2) over sized bunk beds, a storage area and a place for a TV. You can sleep up to (6) people in this RV! The main living area is huge in this 5th wheel because of the (2) opposing slides! The slide on the off door side towards the front has a full galley (kitchen) with beautiful solid surface counter tops, a (3) burner stove top, an oven, a microwave oven with an exhaust hood and the 8 cu ft double door refer! Towards the rear of that slide is the tri fold sleeper sofa. Across from that on the door side is another slide with a free standing table and (4) chairs towards the rear and the entertainment center towards the front with a large LED TV and below that, an electric fireplace! In the rear of the coach are the (2) swivel rocking recliners. It really shows well! There&apos;s no doubt this is going to be one of Jayco&apos;s best selling floor plans and with the bigger discounts we get, we will have the absolute lowest prices! The interior color is the new Peppercorn. It has the Customer Value Package, 50 AMP service with the dual A/C package, solid surface counter tops, an electric fireplace, and the rear electric stabilizer jacks! 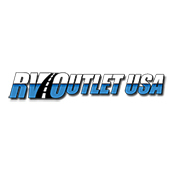 If you have any questions at all, please call 888-299-8565 (ask for Sales), or email us at rvoutletusa(at)yahoo, and be sure to check out our website at RV007(DOT)COM. Please keep in mind, we have NO doc, prep, PDI, transport or any other fees like the larger chain stores have and we always offer huge discounts to our RV customers on 5th wheel hitches and installation, parts and accessories. Give us a call, we&apos;d love the chance to earn your business!